1. Preheat a fan forced oven to 170°C. Grease the base and side of a 22cm round cake pan with melted butter or cooking spray and line with non-stick baking paper. 2. 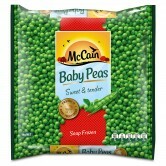 Arrange half of the McCain Roast Potatoes – Rosemary and Garlic in the pan, top with half the McCain Baby Peas and half of the smoked salmon. Repeat layering with the remaining potatoes, peas and salmon; top with dill. 3. Whisk together the eggs and cream in a jug. Pour the egg mixture into your pan. 4. Bake in oven for 50 minutes or until firm in the centre and golden brown on top. Cool 20 minutes. Cut into wedges and serve warm or at room temperature. 5. TIP: This frittata is perfect for make ahead work or school lunches. 1 Preheat a fan forced oven to 170°C. Grease the base and side of a 22cm round cake pan with melted butter or cooking spray and line with non-stick baking paper. 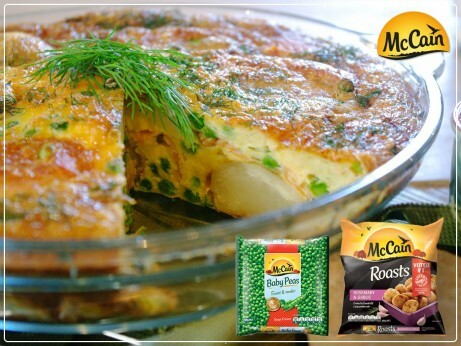 2 Arrange half of the McCain Roast Potatoes – Rosemary and Garlic in the pan, top with half the McCain Baby Peas and half of the smoked salmon. Repeat layering with the remaining potatoes, peas and salmon; top with dill. 3 Whisk together the eggs and cream in a jug. Pour the egg mixture into your pan. 4 Bake in oven for 50 minutes or until firm in the centre and golden brown on top. Cool 20 minutes. Cut into wedges and serve warm or at room temperature. 5 TIP: This frittata is perfect for make ahead work or school lunches.